The 300 block of South 2nd Street in Society Hill, where treasure was said to be buried according to an authentic letter from 1716. 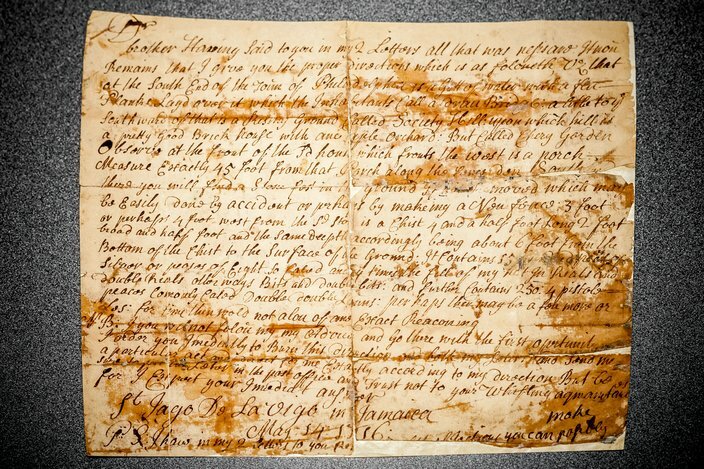 A mysterious letter penned nearly 300 years ago remains housed at the Historical Society of Pennsylvania despite an explicit instruction by its unknown writer to destroy it. No one knows why the letter, dated May 14, 1716, survived. But it is crystal clear why its author wanted the document burned at the recipient's earliest opportunity. It tells of treasure buried in Society Hill. Writing from St. Jago De La Vega, Jamaica, the writer informs an unnamed brother of a treasure trove filled with Spanish currency now commonly associated with pirate tales. He provides detailed directions to recover a chest containing doubloons, pistoles, reales and pieces of eight. The letter concludes with an order to burn it. "Well, evidently, something happened," HSP historian Daniel Rolph said. "He passed away or he decided to keep it. Or, I mean, who knows? "It wasn't destroyed and it's not a fake. It's authentic. It's not made up. So, something happened." That is just one part of the enigma. Another, of course, regards the fate of the treasure. "It is possible that it is there," Rolph said. "But then again, it's possible that he retrieved it, but for some strange reason didn't destroy the document." Rolph, an HSP historian for nearly 30 years, stumbled upon the letter while researching another subject two decades ago. He set the letter aside as one of his many pet projects, eventually posting his initial discoveries to his Hidden Histories blog eight years ago. Given Philadelphia's trade involvement with the West Indies, Rolph suspects a member of the Society of Free Traders penned the letter. 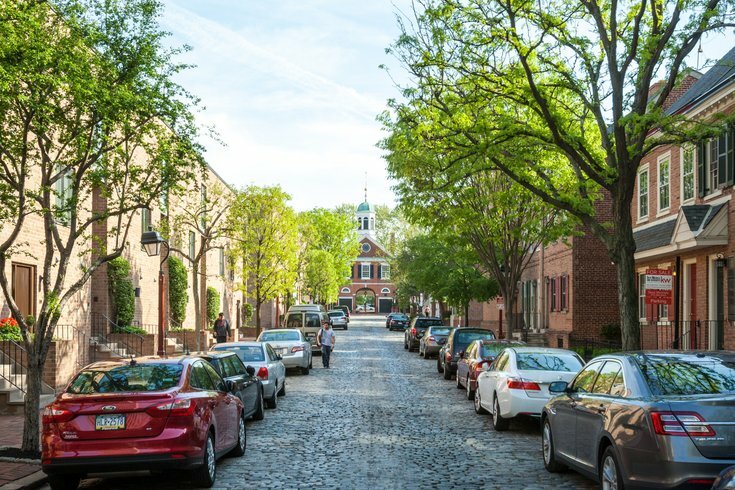 The mercantile group settled in Society Hill in 1682 and gave the neighborhood its name. The merchants were wealthy and known to travel, but the organization itself went bankrupt in 1723. "Early Philly had a big trade network going into the West Indies," Rolph said. "A lot of illegal trade was going on with the French, with the Spanish. Of course, they weren't supposed to, but it happened, of course, anyway." Rolph did not attempt to locate the treasure himself, but he playfully encouraged his readers to follow the clues outlined in the letter. The letter references a single brick house built atop rising ground called "Society Hill" and located "a little to the south" of a "gritt of water" crossable by a drawbridge. The house contained an apple orchard known as the "Cherry Garden." "Observe at the front of the house which fronts the west is a porch. Measure exactly 45 foot from that porch along the fence. ... There you will find a stone post in the ground. ... 3 foot or perhaps 4 foot most from the (stone post) is a chist 4 and a half foot long, 2 foot broad and half foot and the same deepth accordingly being about 6 foot from the bottom of the chist to the surface of the ground." Anyone looking to unearth the treasure chest might have some trouble. The landmarks described in the letter are long gone. Society Hill, of course, is filled with historic rowhomes lined by brick sidewalks. There is little undeveloped land or green space. But Philadelphia historian John Fanning Watson, who died in 1860, referenced the drawbridge, Cherry Garden and a "precipitous and high bank" in Society Hill in his 19th century manuscripts detailing the city's history, Rolph said. The drawbridge and creek running along Dock Street are included on old maps, but by the 1680s – some three decades before the letter was written – many brick houses were being constructed in the area. "I get the impression it had to have been buried many years before," Rolph said. "By 1716, it was built up along the docks and all down that area." Nevertheless, at least one treasure hunter claims to know where to find the coins – if they still remain. A mysterious letter, penned May 14, 1716, by an unknown man in Jamaica, provides detailed directions to treasure buried in Philadelphia's Society Hill neighborhood. Dennis Parada, of Clearfield, Pennsylvania, about 190 miles northwest of Philadelphia, began seeking the treasure soon after Rolph posted the letter to his blog. Parada owns a professional treasure hunting company, Finders Keepers, that claims to have located various treasures, including $20 million worth of gold bars in Elks County. The Society Hill treasure likely lies at one of two locations along Second Street between Spruce and Pine streets, Parada said. "I'm 100 percent sure it's right there," he said. "There's no ifs, ands or buts." Parada determined his suspected site by locating the given landmarks – the drawbridge, for example – on old city maps. He struggled to recall his specific methodology, given that seven years have lapsed since he conducted his research. But he said the process did not take long. Parada and his mother, Rose, transcribed the letter in about a week. It took another month or two for him to narrow his hunt to a specific location. "Once the letter is (transcribed), any treasure hunter can sit down with the maps," Parada said. "They'll locate the lot, no problem." Yet, Parada never visited Society Hill or the suspected site. For one, he doubts the treasure remains. Years of development likely led to it being uncovered accidentally, though Rolph failed to find any such account when he briefly searched archived newspapers. Scanning for the treasure would require Parada to use high-powered metal detectors, which cost thousands of dollars. Property owners would need to grant permission for him to enter their homes, a process he never undertook. But he did enlist the Historical Society of Pennsylvania to support a search, but that never came to fruition. "We have the knowledge how to scan underneath all of those homes," Parada said. "Again, nobody wants us there, so we're not going to go." Even if Parada – or any prospective treasure hunter – found the treasure, they might not be entitled to keep it. Pennsylvania law does not state clearly who would get to keep the coins, according to Temple Law professor Finbarr McCarthy. That's because the state Supreme Court refrained in 1949 from considering whether "treasure trove" law had ever been adopted by Pennsylvania. If the coins are deemed a "treasure trove," a designation that encompasses gold and silver coins, a court could follow common law practices that treat it as lost or abandoned property. In that case, McCarthy said, the original owner, if found, receives the treasure. Otherwise, the finder keeps it – unless he or she was trespassing. Then it goes to the property owner. But a court also could apply an old English statute that deems treasure trove as state property, McCarthy said. Or the coins could be classified as "mislaid," which seemingly would give the property owner the best claim. "These are stupid distinctions because we have no clue what anybody was thinking at the time that they did this," McCarthy said. "Did you voluntarily put something down and forget about it? Or did you happen to lose it? "You can see how a court might go either way. They might say this property was deliberately put in this place. On the other hand, they might say it's lost and it goes to the finder." 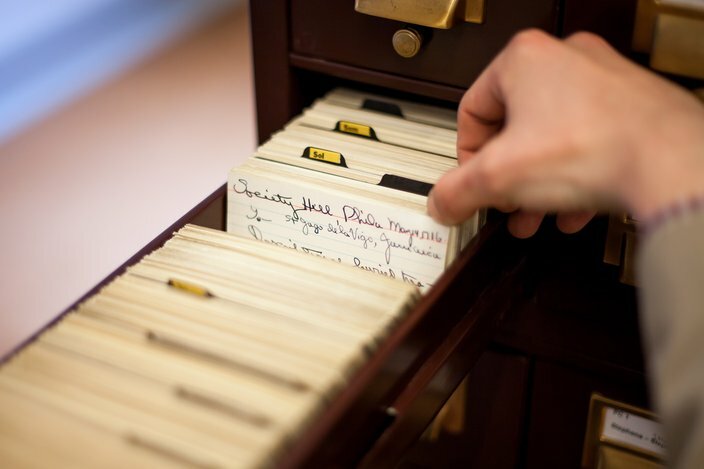 An index card indicates the location inside the Historical Society of Pennsylvania where researchers can find an 18th century letter detailing treasure buried in Society Hill. While the possibilities of buried treasure might inspire some, Rolph is more intrigued by the other mysteries surrounding the letter. Who are the brothers? When was the treasure buried? And what happened to the two prior letters referenced in the existing one? "If he didn't destroy this, maybe he didn't destroy the other two either and they're sitting in another repository somewhere," Rolph said. "Or maybe even here. That would give more details." Maybe one of the merchants sensed the impending financial collapse and buried his fortune, Rolph suggested. Or maybe a trader buried it shortly after William Penn granted the group a charter in the 1680s. England forbade banks in the Colonies, prompting some to use – and store – foreign currency. "There's been plenty of people for centuries that have been burying wealth, hoping maybe someday to come back and pick it up," Rolph said. "If they were involved in the West Indies trade, the ship could have sunk that he was on. He could have drowned. There were smallpox and all kinds of diseases that went through early on. There's all kinds of ways to speculate what might have happened." If he dedicated considerable time, Rolph suspects he could at least determine the identities of the brothers. He instinctively suggested James Claypoole, the treasurer of the Free Society of Traders. His brother, Edward, spent time in Barbados, another West Indies island. But both brothers died years before the letter was penned. But another trader could have had a brother living in Jamaica. Researching each member of the trade organization could lead to a suspected sender. Then, the letter could be compared and contrasted with any other known writing samples. 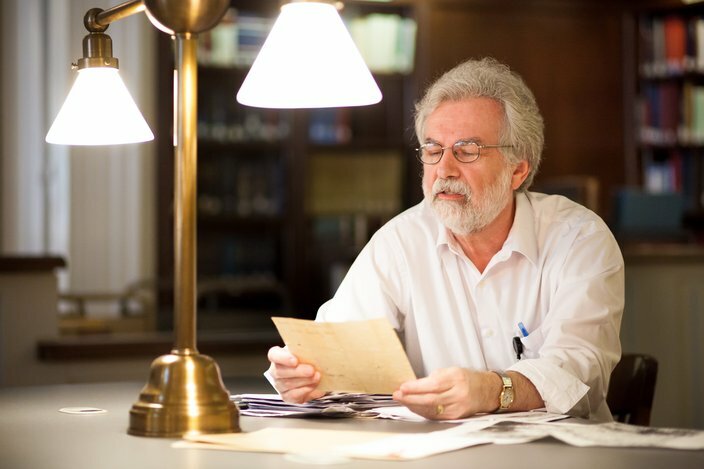 "Out of 21 million manuscripts, we probably have other writing samples of this guy," Rolph said. "I was just curious if there were two brothers involved in the West Indies trade. There were goods, again, being shipped back and forth." HSP has records detailing how most of its manuscripts came into its possession. But it does not have one for this letter. No one knows when it arrived or who dropped it off. A pair of filing cards simply note where the document can be found inside the historical society. The clues are few – just like those to the buried treasure. "If it's still there," Rolph surmised, and "it's ever found, it will be accidentally."